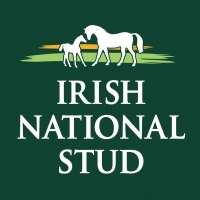 Irish National Stud Stallion Famous Name’s first foal was born on Monday night at Dachel Stud, Newmarket. The new-born colt was described by his breeder Ros Norman as “a perfect bay, having good bone and strong limbs with a great top”. He is out of the young unraced Pivotal mare Sweet Power. She has had one winner from one runner and is out of the multiple group winning mare; Sweet Ludy. Sweet Ludy won the Gr.2 San Clemente Stakes at Del Mar, the Gr.2 Honeymoon Handicap at Hollywood Park and was placed 3rd in the Gr.1 Del Mar Oaks. Famous Name won an exceptional 20 stakes races in his extended race career and was narrowly defeated by Vision d’Etat in the Gr.1 Prix du Jockey Club during his classic campaign. It was one of seven times he placed in Group 1 company during his amazing six season race career. He won or placed 35 times in his 38 starts winning over €1.5 million in prize money! Now in his new career, we are delighted to welcome his new arrivals and hope that his class and consistency will be passed on to his offspring. He stands at the Irish National Stud for €4,000.